★CERAMIC SOLAR LIGHT: Package Size:13 x 13 x 12cm, Easy Install - No wires,sensitive to light, auto on at night and auto off at the sunrise; Convenient to use.It is mainly ceramic, adopting high-quality materials. High temperature corrosion resistant, resistant to moisture. 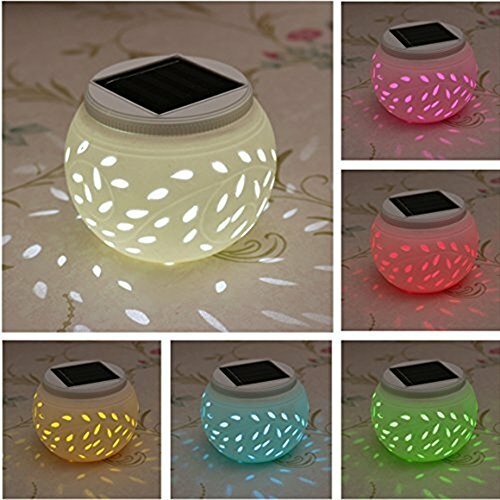 ★COLOR CHANGING: The solar light can be put into three different modes,one switch Off,One switch for white light and one switch for colour changing light. 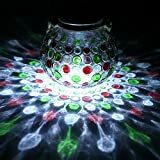 the solar light shines in the dark in a miraculous light, Solar powered filigree design table lights.whether red, blue, purple, yellow, green or even white. The color change can be adjusted by means of the switch.Great for your own use or to give as a gift. ★HIGH EFFICIENCY: Covered with solar panel that charges the battery in the day.Lamp will work for 6-8 hours an a full charge For best results light should be charged for 6-10 hours approx.Fantastic attraction and ornament great piece to anywhere! ★AUTO SENSOR : Let the light do all the work for you! An automatic sensor detects sunlight, turning on and off the light with the departure and arrival of the sun. This way, you can spend more time with your guests, and less time fussing with lights.High power single silicon solar cells, rechargeable conversion rate of up to 17%. No battery needed. A small built-in rechargeable battery stores the solar energy. ★APPLICATION: White ceramic body with attractive design.Energy-saving,creates a romantic and lovely accent, ideal for home,patio garden tables and indoor/outdoor decorations,also a best gift for your family member,friends,your parent and so on. If there any issue about this product, please feel free to contact us first,We'll get it resolved as soon as, we will give the best solution in the first time. 1.This Solar Power Light Is Very Popular And Energy-Saving,Environmental Protection. 2.High Quality Body, Overall Use Of High Quality Materials, High Temperature Corrosion-resistant, Moisture-proof. 3.When Evening Come, The Solar Fence Light Will Automatically Send Out Light, And Will Automatically Off In The Daytime.